This article was posted by Quinn McDowell, founder of Arete Hoops. Quinn played basketball at Archbishop Moeller High School (Cincinnati, OH), 4 years at the College of William and Mary, 1 season in the NBA D-League, and 2 years as a professional in Australia. Arete Hoops is dedicated to helping people of various ages, backgrounds, skill levels, and athletic goals pursue excellence in and through the game of Basketball. 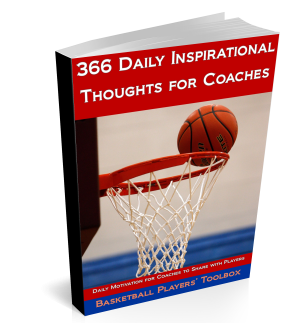 I hope you can use some of these thoughts to share with your players that you are counting on to be team leaders for the upcoming season. Take Tim Duncan for example. He is a dynamic package of killer efficiency that has adapted his game to his teammates instead of forcing his teammates to adapt to his style. Duncan’s value never resided in gaudy stats or eye-popping numbers; rather his greatness was always about something bigger than himself. The real value of his game always resided in his mind numbing consistency and determination to raise the level of his team in whatever capacity he could. In this refusal to elevate his personal desires above the mission of the team he has elevated himself to one of the greatest players the NBA has ever seen. Tim Duncan never set out to be the greatest player of his generation, all he wanted to do was just “make a difference”, and that is the true value of greatness. Does your leader make a difference by serving others? Do they chose to use their abilities to illuminate the talents of those around them? Have they adopted a flexible leadership style that allows them to adapt to changing circumstances and the needs of their team. The bedrock of this leadership style has always been founded on a simple question: what can I do to make those around me better? One of the great marks of a servant leader is that they are remembered as great because of their leadership, commitment to excellence, and care for others. By definition, a leader is someone whom other people are willing to follow. Great leadership at its most foundational level has the ability to attract a group of talented individuals to accomplish a shared goal. A leader has an attraction about them that players are drawn to. They entice other talented players to join them in working towards a common goal. They have an inviting personality and team-first attitude that encourages everyone to work for the good of the team. Leaders accentuate the talents of their teammates by helping them come closer to reaching the limits of their abilities. One of the most telling signs of effective leadership is always measured by the growth of people around them. Great leaders help turn average players into good players, good players into great players, and great players into game-changing players. One of the primary goals of great leaders is to invest in the people around them and help raise their level of performance. Great leaders earn the respect and trust of their followers by submitting themselves to the same standards they enforce on others. Double standards, favoritism, and hypocrisy cripple healthy team dynamics and glorify the individual instead of the group. Great leaders foster an environment of where people are free to speak their minds in a spirit of collaboration and teamwork. They create a safe place for their teammates that is marked by the characteristics of trust, mutual accountability, and honesty.